(Oct. 30, 2013) -- The Texas Sustainable Energy Research Institute at The University of Texas at San Antonio has been selected to receive a three-year, $750,000 competitive award through the U.S. Department of Energy SunShot Initiative to develop solar energy technology and to recruit and train underrepresented minorities for jobs in the solar energy industry. UTSA was one of two U.S. universities to receive the SunShot DISTANCE (Diversity in Science and Technology Advances National Clean Energy in Solar) award, which pairs science and technology research advances with the development of a diverse and innovative workforce. According to the National Solar Jobs Census the U.S. solar industry employs 119,000 workers across the nation. The solar energy industry has created nearly 20,000 new American jobs since 2010. Both UTSA and St. Philip's College are minority-serving institutions with a strong heritage of working together to train students for successful STEM-related careers. Each organization maintains an active pipeline of underrepresented students who are interested in pursuing STEM-related careers. Additionally, both universities proactively recruit highly qualified students from underrepresented communities across Texas. To encourage more underrepresented students to pursue solar energy careers, UTSA and St. Philip's will expand upon existing STEM-related recruitment strategies to develop a pipeline of high school- through college-aged students who are interested in renewable energy. The organizations also will offer generous financial support to second-year community college students, undergraduates and graduate students. At UTSA, students will receive financial assistance by conducting solar energy research through the program. Additionally, UTSA will offer opportunities such as technical forums, invited talks and professional conferences to give students face-time with employers who may be interested in hiring them once they graduate. 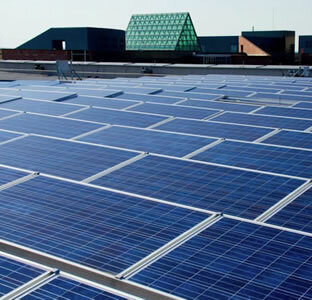 UTSA and St. Philip's College own a sum of four grid-connected photovoltaic systems with a combined rating of more than 700 kW. The installations are already capturing high-resolution solar data about power generation and their cost and energy savings. As part of the DISTINCT program, UTSA will develop photovoltaic systems research opportunities for undergraduate and graduate students. Specifically, students will contribute to the development of an N-port power electronic converter, which could ultimately reduce the cost of a PV system, maximize energy output and limit PV ramps using short-term forecasts. UTSA and St. Philip's College also will use funding from the grant to enhance and expand their combined solar curriculum. Currently, UTSA offers 15 courses with a varying focus on solar energy through its Architecture, Engineering, Business, Public Policy and Sciences colleges. St. Philip's College is home to the Power Generation and Alternative Energy program, a two-year associate degree in science program that boasts a 78-percent minority student population and emphasizes the technical and installation aspects of solar energy technology. As the DISTINCT program progresses, UTSA and St. Philip's College will work with solar energy industry stakeholders to develop entire courses devoted to solar energy theory, practice and policy. At the same time, the organizations will enhance the amount of instruction related to solar energy in related courses, and they will offer teaching laboratories and field experiences to enhance students' understanding of course curriculum. Additionally, UTSA and St. Philip's College will revise and align the requirements of both institutions, facilitating the admissions process for solar energy transfer students. "This opportunity to research for a green cure to higher energy prices is an opportunity for the serious students of solar energy technologies in our service area," said Daniel Sherry, chair of the Department of Applied Electrical and Mechanical Technology at St. Philip's College. "Students who are ready to research, innovate and give back at the same time as part of their St. Philip's College experience with UTSA will be a perfect fit for this mission." "We are thrilled that the Department of Energy has recognized the combined strengths of UTSA and St. Philip's College in solar energy education and research," said Hariharan Krishnaswami, UTSA assistant professor of electrical engineering and DISTINCT project principal investigator. "We aim to create a top-tier solar energy program that allows students to recognize the impact of renewable energy, the strength of the San Antonio solar energy market and the exciting career opportunities available to them." The Texas Sustainable Energy Research Institute was established at UTSA in 2010 to serve as a catalyst coalescing the many energy research and education projects underway at UTSA. The institute maintains strong partnerships with CPS Energy, the National Renewable Energy Laboratory, private energy companies, universities and nonprofits. Researchers leading the interdisciplinary project include Krishnaswami; Les Shephard, director of the Texas Sustainable Energy Research Institute at UTSA; Afamia Elnakat, associate professor of research at the institute; and Daniel Sherry, chair of the Department of Applied Electrical and Mechanical Technology at St. Philip's College. During President Obama's first term, the nation more than doubled generation of electricity from wind, solar and geothermal sources. Additionally, over the last three years alone, the cost of a solar energy system has dropped by more than 70 percent, allowing more American families and businesses access to affordable clean energy. The U.S. Department of Energy SunShot Initiative is a collaborative national effort that aggressively drives innovation to make solar energy fully cost-competitive with traditional energy sources before the end of the decade. Through SunShot, the Department of Energy supports efforts by private companies, universities and national laboratories to drive down the cost of solar electricity to $0.06 per kilowatt-hour. Bishop James Steptoe Johnston of the St. Philip's Episcopal Church of the West Texas Diocese founded St. Philip's College in 1898. Today, St. Philip's College, a member of the Alamo Colleges, is a multi-campus institution and serves a semester enrollment of more than 11,000 credit and more than 8,000 continuing education students. St. Philip's College is a Historically Black College and a Hispanic Serving Institution. As "A Point of Pride in the Community," St. Philip's College is among the oldest and most diverse community colleges in the United States.